Intervention logic is a representation of clear and well-thought-out understanding how planned policy actions are expected to lead to desired outcomes. By identifying causal links among inputs, activities, outputs, and longer-term outcomes of a specific policy intervention, it allows to develop a more comprehensive theory of change. Essentially, the intervention logic clarifies how a change induced by policy action at the micro-level (e.g. firms, households) leads to a desired change at a higher-level (e.g. specific sectors, whole economy), and eventually how this change contributes to the achievement of strategic goals at regional or national level. Smart specialisation represents a complex policy intervention with the aim to foster regional/national economic transformation. Hence it is important for the regions to carefully design their RIS3 intervention logic linking objectives, targets, inputs, actions, outputs, results and longer-term outcomes. The building of this logical model is particularly important to define further a tailored RIS3 monitoring and evaluation (M&E) framework, which has been set as an ex-ante conditionality for receiving ESIF support. “Explicitly identifying expected changes is equivalent to setting specific objectives for the RIS3 and is hence a fundamental element of the monitoring system” (Kleibrink et.al., 2016). There is an inherent correlation between an intervention logic and the design of M&E framework. On one hand, intervention logic forms a skeleton for M&E system; on the other hand, findings from continuous monitoring and evaluation exercises feed back intelligence that may alter the initial assumptions about certain causal links and thus call for adjustments in the defined theory of change of RIS3. Regarding the current approaches to RIS3 intervention logic design, it appears that there are important gaps in the existing practices to devise sound theory of change for smart specialistion. The mapping exercise results show that intervention logic charting exercises during a policy mix design phase have been highlighted only by around 40% of the selected regions. Given that intervention logic should form the backbone for setting the overarching goals of smart specialisation, this seems to be a surprisingly small share. Either regions are not well acquainted with the approaches to intervention logic design or they do not explicitly document their assumptions about causal chains of RIS3 policy intervention. A recent study (Kleibrink et.al., 2016) has looked at the issue how regional and national policy-makers in charge of RIS3 perceive the constituent elements and functions of monitoring. In the scope of this study a comprehensive survey among policy makers has been carried out, including also issues about intervention logic set-up. The study team obtained 96 complete responses, 80 from regional policy-makers representing 68 regions, and 16 from national policy-makers representing 12 countries in Europe, corresponding to a total response rate of 22%. The survey results indicated that there is a diverging pattern among regional and national policy-makers in describing the RIS3 intervention logic. “At the regional level, the majority of respondents (64%) report a direct link between the expected changes identified in the strategy and each of the RIS3 priorities. This result is consistent with an intervention logic that is highly priority specific, which accords with the smart specialisation approach. At the national level, respondents related expected changes only to overall RIS3 objectives, showing that national RIS3 are mostly not priority specific” (Kleibrink et.al., 2016). Moreover, the study results showed that “only 26% of regional and 19% of national respondents made an explicit connection between result and output indicators, despite evidence of their understanding and application of the RIS3 logic of intervention” (Kleibrink et.al., 2016). The authors point that, if this indication is confirmed, it means that there is an incomplete understanding or misinterpretation of the policy logic of intervention among regional and national policy makers that goes beyond the context of smart specialisation. The weak monitoring of the last phase of policy cycle means that there is no robust ‘implementation theory’ yet in place (Weiss, 1998). Designing intervention logic starts with understanding both the problem to be addressed and the desired outcomes to be achieved, specifying the program logic, and building stakeholder consensus related to this theory of change. Once this agreement is in place, stakeholders can focus on selecting appropriate indicators to measure intended outputs and outcomes, setting baseline and target values, and exploring the relevance of available data and data collection methods. In order to communicate the logic of intervention, the visual representation of the intervention can take various forms. The design should help practitioners understand not only the intended outcomes of an intervention but also the inputs and activities needed to achieve them. 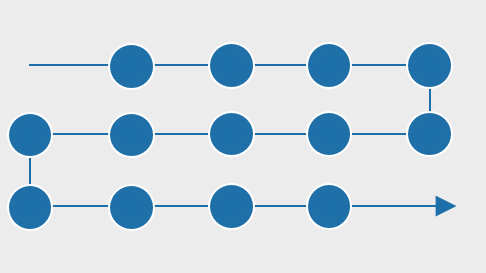 An intervention logic can be designed as a series of boxes (inputs->processes->outputs->outcomes->impacts), a table, a flowchart, or even a circular sequence. Definition of the responses to put in place in order to meet the objectives, i.e. formulation of solutions to selected problems – Phase 3. Further the authors elaborate that “the responses to meet strategic objectives consist of specific combinations of four elements: (E.1) levers to change the existing state of affairs in specific socio-economic dimensions; (E.2) economic or knowledge domains, specific markets; (E.3) groups or categories of subjects that can potentially activate the change; (E.4) economic or regulatory instruments of intervention” (Gianelle and Kleibrink, 2015). Figure 13 provides a practical example of this conceptualisation of an intervention logic by applying it to agro-food sector. To facilitate the process in defining causal links and ensuring that policy measures are coherent with the vision and objectives of the region/country, an information support tool will be developed. This tool will categorise all possible types of policy measures relevant to RIS3 implementation, specifying respective beneficiary target groups and possible effects (outputs, results and longer term outcomes). A dashboard type of functionality will enable regional and national policy makers to steer the design of an intervention logic for each specific priority. It will allow to select priority domains/markets and, using an online guidance with key questions and issues to be considered, help define specific lever(s) in these priority domains. Further, taking into account the information on the enlisted effects of all types of support measures, users will be able to add policy instruments tailoring a specific policy mix to influence the identified lever(s). The intervention logic design dashboard should be easily extracted as PDF and Word files enabling communication of the rationale behind RIS3 policy intervention among all involved stakeholders. The tool should form an integral part of approaches developed under 6.1 RIS3 monitoring and 6.2 Definition of RIS3 output and result indicators. Charting of RIS3 intervention logic should form the backbone of policy approaches for steering smart specialisation, yet as the available evidence indicates there is still an incomplete understanding or misinterpretation of the policy logic of RIS3 intervention. The application of the intervention logic information tool should help to elucidate to regional and national policy makers possible logical linkages among the identified priority sectors, key levers, main actor target groups and eventually the specific policy instruments. This support will help to make RIS3 policy assumptions more explicit. Clearer and more detailed intervention logic models will help RIS3 managers to ‘plan with the end in mind’, rather than just limiting their focus on inputs, implementation activities and immediate outputs. Using the logic model policy makers can also more easily back cast the intended results and longer-term outcomes of a particular support programme (e.g. during a mid-term evaluation) and identify the necessary corrective actions to achieve all desired results. 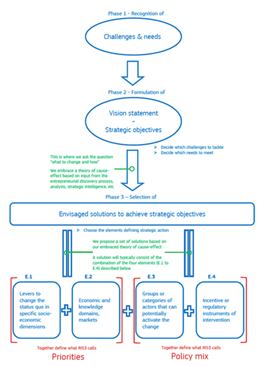 In other words, intervention logic together with a feedback loop from M&E system serves as a living management tool fostering consensus on planned activities, guiding corrective actions, facilitating the coordination of development efforts, charting the course for achieving strategic objectives, and ultimately serving as key accountability instrument to RIS3 stakeholders and wider society. To build the envisioned information tool and dashboard for RIS3 intervention logic design, there is a need to have a list of all priority sectors/domains selected by European regions. The current Smart Specialisation Platform tool – Eye@RIS3 – that maps the selected RIS3 priorities still categorises them according to traditional industry classifications. There is a need to explore, if more fine-tuned classification that includes also cross-sectoral and emerging industries can be devised. The tool requires a listing of all relevant policy measures used to support research, development, innovation, entrepreneurship, higher education and skills development. Moreover, there is a need to compile concise and coherent information on evidence of possible outputs, results and longer-term outcomes of each type of support measures. The effects of specific policy intervention obviously differ across various contexts and are influenced by a diverse set of framework conditions, yet results of decades long evaluation exercises across the world can give sound indications on the type of effects that generally can be expected from various policy support measures. The list of new cross-sectoral and emerging industries should be aligned with the European Cluster Observatory categorisation and other policy monitoring tools of DG Growth. Science and Innovation Policy Evaluation Repository (SIPER) is a database consisting of science and innovation policy evaluations from across the world. SIPER is run by a team based at the Manchester Institute of Innovation Research and it gathers a comprehensive repository of evidence on effects of wide range of RDI policy support measures – http://datasets.risis.eu/metadata/siper. Various guidance documents, e.g. those commissioned by DG Regio http://ec.europa.eu/regional_policy/en/policy/evaluations/guidance/#4, can be used to construct necessary information for policy mix design. Gather and categorise evidence base on possible effects of each support measure type. Gianelle, C. and Kleibrink, A. (2015). 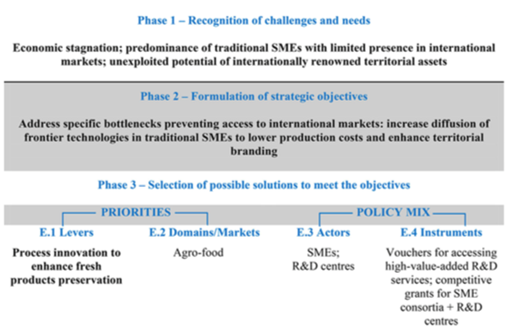 Monitoring mechanisms for smart specialisation strategies, S3 policy brief series, 13/2015. Spain: European Commission, Joint Research Centre. Kleibrink, A., Gianelle, C. and Doussineau0, M. (2016) Monitoring innovation and territorial development in Europe: emergent strategic management, European Planning Studies, 24:8, 1438-1458. Weiss, C. H. (1998). Evaluation: Methods for studying programs and policies. Englewood Cliffs, NJ: Prentice Hall.